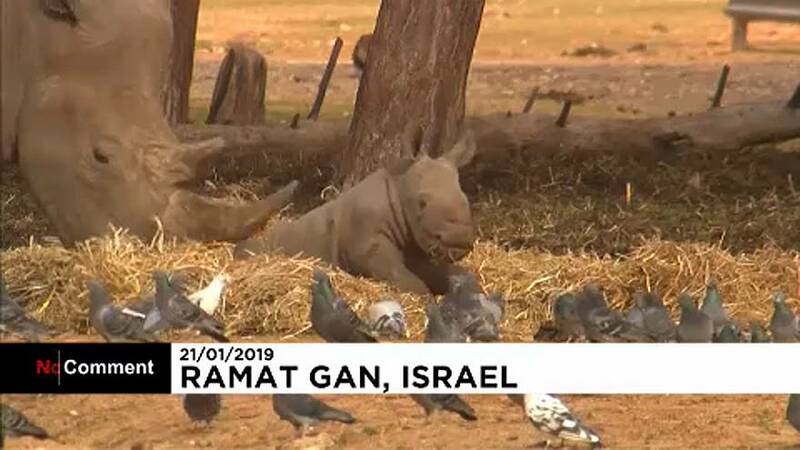 A newborn rhino enjoyed a day of fun at Israel's Safari open park on Monday, getting to know her crash partners and rolling in the dirt. The young rhino was born on December 30 and is the 31st white rhino to be born in the zoo, which takes pride in being one of the leading zoos in breeding rhinos. According to zoologist Keren Or, the rhino mother gave birth in the African park before zookeepers could lure her into a fenced area where she could deliver safely. Both the mother and her baby stayed in a fenced area for a few weeks before the newborn managed to get out of and began exploring her new home, while still staying close to her mother for protection.